When you think of the term 'dove' you think of the White Dove. The White Dove has been one of the most universal symbols of love and peace throughout history! The White Dove, Sacred White Dove, or Java Dove is the most historically described dove from Noah through today. We often see it used today as an emblem in peace negotiations. We also commonly see it used in weddings to symbolize love. Though it is very popular to use White Doves for what are called 'wedding releases', it is actually white homing pigeons that are used. White homing pigeons are very strong flyers, have a well developed homing instinct, and will return to their dovecote. The White Dove is not the same bird as the white homing pigeon. Though they are both white, the White Dove is a smaller bird. It does not fly straight for long distances but rather flutters about, and it does not have a highly developed homing instinct. Another area where White Doves are commonly used is in magic acts. They are intelligent birds that can be taught simple tricks, and they are not afraid of being in a cloth handkerchief or a dark hat. White Doves are very popular and an excellent bird for a beginner They are actually a white variety of the Ringneck Dove though a bit more expensive, and they have all the good points of the Ringneck Doves.They are very easy to care for and have a very sweet gentle nature. They will do well in either a cage or in an aviary and can be kept as a single bird or as a pair. Once a White Dove is comfortable with its home and its family, It can be handled by adults and children alike. Scientific Name: Streptopelia risoria var. 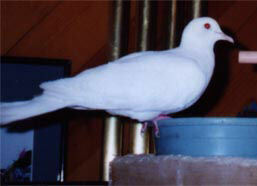 Distribution: The White Dove, Sacred White Dove, or Java Dove are a white mutation of the Ringneck Dove. Like the other Ringnecks, they are only known to exist as a domesticated bird. See Ringnecked Doves for more information on their history. Description: White Doves are small birds, about 12" from head to tail. They will live an average of 10 - 15 years, though some may live over 25 years. In the 1800's & early 1900's the Ringneck Dove and the White Dove were considered to be two different species/races of dove due to the difference in their coloration. They were labeled the "Blond Ringneck" Steptopelia risoria and the "White Ringneck" Streptopelia alba. Many years elapsed before it was determined that these two birds were the same species, just two different color phases. These two colors were the only known colors in the United States until the 1950's. Care and feeding: Suitable housing for a White Dove would be a large cockatiel cage along with some flight time outside the cage. A pair can be kept and bred in a cage as small as 2 feet square. Cages that are longer and wider are more important than tall cages, as these birds flutter around and do not climb. Males tend to be quarrelsome with other males so keep pairs housed alone. Like the Ringneck Dove they are quite hardy. If they are kept outdoors and are accustomed to cold weather, they can take below freezing temperatures for a short period of time. White Doves are very clean birds and love to bathe. They will enjoy either a bath in a large bowl of water or a shower, a misting with a light spray of clean water. A commercial dove and pigeon mix or a regular parakeet seed mix supplemented with greens rich in minerals, vitamins, and calcium is a fine diet. White Doves love treats. They not only enjoy their greens, but will also enjoy spray millet and such things as crumbled cornmeal and bread. Grit is essential as all Ringneck Doves swallow their food whole, and it helps grind up the food. Oyster shell or even cuttlebone can be added for calcium and is important for egg layers. Social Behaviors: They are good-natured social creatures that do well when kept in cages or in aviaries. They can be rather territorial however, and will need plenty of personal space. They can be easily tamed with very little effort. They form permanent pairs and mates do well if kept together. If kept in a cage, they should be let out daily for some free time to exercise. They are not known to be strong fliers and will be content to just flutter here and there and then will quickly settle down. Breeding/Reproduction: White Doves are easy to breed, but are not usually community breeders unless there is a lot of room. They will do best in their own cage and it can be relatively small. They are rather flimsy nest builders so it is best to provide them with an open nesting container. They can be bred as early as 6 months of age. They will lay two eggs which hatch after about 14 days. The young will stay in the nest for about 4 weeks or so. The parents can lay a new clutch of eggs every six weeks but this is very unhealthy for the birds. It is recommended that they only produce 3 to 5 clutches a year. You can remove the nesting materials or separate the birds to control this. Availability: White Doves are readily available. Usually available at pet stores, but can also be found through bird shows, bird clubs or breeders. I am looking for a white female dove. Need the price. I know this is in truth boring and you are skipping to the next comment, but I just wanted to throw you a big thank you - you cleared up some things for me! I have been looking for a white dove to buy for my home and I'm wondering if I'm looking in the right spot and actually how much they go for?